I am very interested in anything that has to do with death. Like for example what people do and say about their own death. Based on my experiences, I don’t expect that there is a life without a body. At least not for the body that died. I don’t believe that we have a soul, or whateveryoucallit, that lives on after the body ceases to function. So, I don’t believe in heaven or hell, and neither in reincarnation. The fact that we have no idea how and when we are going to die, is weird, because it is such an important event in our life. The whole concept of death is weird: just think of the fact that no one dies in his own life, but that it are always the others who are dying. Just like Robbie Williams, I am not afraid of death, but I am not to keen on living either. But because suicide is no option for me, I just make the best of it. And that is fairly easy, considering the luxurious circumstances that I live under. 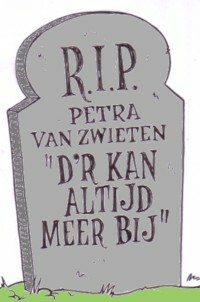 The husband of Petra van Zwieten told me recently what she wanted to be written on her tombstone: ”Er kan altijd meer bij” . Apart from the fact that it made me laugh, I realised that I had never thought of what text I might want on my tombstone. Do I want to say something from beyond my grave anyway? I have been thinking about this for a few days now, but I still don’t know. I have already said so much in my life, maybe it is better to say nothing when I am death. When I was younger, I often thought about the music that I wanted to be played on my funeral. I even wrote the songs down several times. But I no longer care; I think it is something that others should decide. Just as I no longer care what will happen to my stuff. Today I thought about starting a project: I publish a list with all kind of questions on death on a website, and then publish the answers with (or without) comments in a daily blog. Of course I am not going to do that, but I certainly would be interested in what kind of “last words” people might have on their mind, that they want to be written on their tombstone. Here at the edge of the Dutch bible belt very few people understand that it felt like a liberation or a relief to me when I came to the conclusion that there is no afterlife and that there is no Frankensteinish Superbeing that constructed us in order to put us to the test and that rewards the ones who adore It and those that do what It decides is right and that punishes the ones who don’t.